I recently acquired this solid black imperial blaster off eBay. The seller claims it came from a tri-logo Luke Stormtrooper. It is darker than my other Luke Stormtrooper blaster and my packaged Droids black blaster. It has a fat end instead of thin and a dent on the barrel. It passed the float an drop tests. It does not look like any other blaster on the TIG list. The tip of the barrel is a slightly translucent black/gray when held to a strong light. Any thoughts? 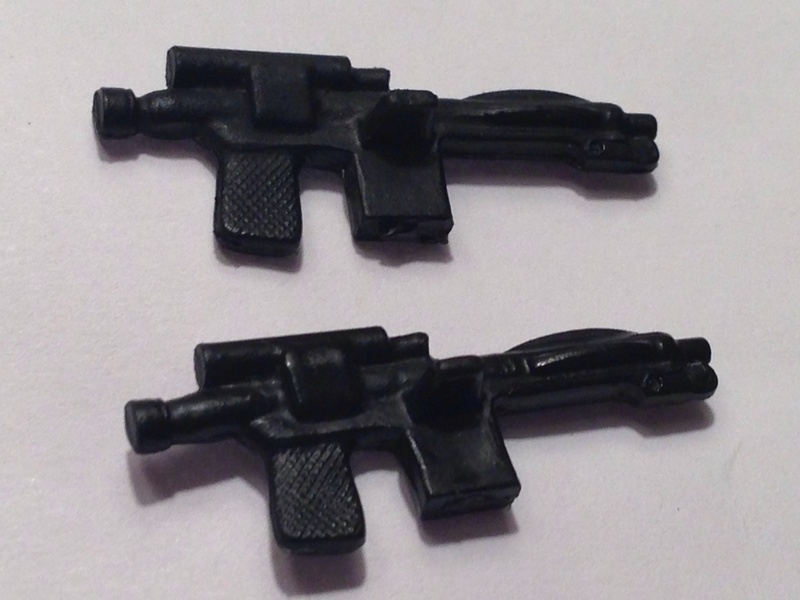 Blaster in question on the bottom of the image, solid black POTF blaster above for reference. Looking forward to see pictures, so the guys here can help you further. BRW: If you like, please give a small intro here, so we will get to know you a bit better. Thanks for the help. Picture posted!